‘Weaving Futures’ at London Transport Museum (LTM) was a commissioned, jointly curated 3 month exhibition by Philippa Brock & Samuel Plant Dempsey. Dates: 22nd Nov 2016 – 19th Feb 2017. The exhibition was funded by The London Transport Museum, Camira, The Worshipful Company of Weavers, Pointcarre and Digital Weave Norway lent a state of the art TC2 studio jacquard loom for the duration. Brock was approached by Transport for London to both curate and participate in an exhibition to explore how to highlight the importance of woven textile design research and thinking within London Transport systems, linking within LTM year long ‘Designology’ exhibition. 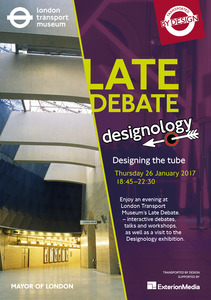 The Designology exhibition was highlighting the importance of design in London Transport Systems. •	Encouraged a new diverse general public audience to LTM, as well as not alienating the existing enthusiast and school/family attendees. •	LTM featured it on their website and a pdf of the timetable of when designers were in residence. Design brief around data and London transport systems trialed at CSM 2nd year BA (Hons) Textile Design in a weave and print collaboration project, along with Transport for London. Alongside Weaving Futures, a Central Saint Martins Musuem public Gallery window was commissioned to coincide with the exhibition. CSM weave department has produced x4 alumni and/or tutors who have all designed moquette fabrics for London Transport in both the 20th & 21st Centuries. Their work from the CSM archive was exhibited alongside Wallace Sewell – current TFL moquette designers. Brock & Dempsey worked with the Musuem to select the work and with Wallace Sewell for the final layout. Woven jacquard textiles. 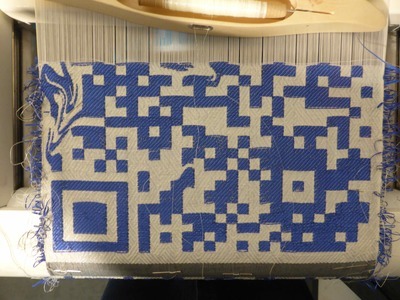 Polyester warp: wefts dependant on works but include, wire, phosphorescent, cotton, silk, nylon, viscose, reflective, wool.